Most people think the English Muffin must have originated in England, but did you know that it was actually invented in America in 1894? In fact, those across the pond had never even heard of this breakfast staple until the 1990s when it was first exported to the United Kingdom from the USA. The Brits do get some credit, however, since the inventor was a British immigrant— Samuel Bath Thomas— who became a U.S. citizen. Mr. Thomas first worked in a bread bakery in New York, then later opened his own bakery where he created a “toaster crumpet,” a version of the English crumpet that was both flatter and what is now called fork-split. He used a secret process that included griddle baking to create a muffin that was crunchy on the outside and soft on the inside. Thomas’s technique preserved the “nooks and crannies" where all the delectable toppings— butter, jam, cream cheese— congregate and provide a treat for your tongue. 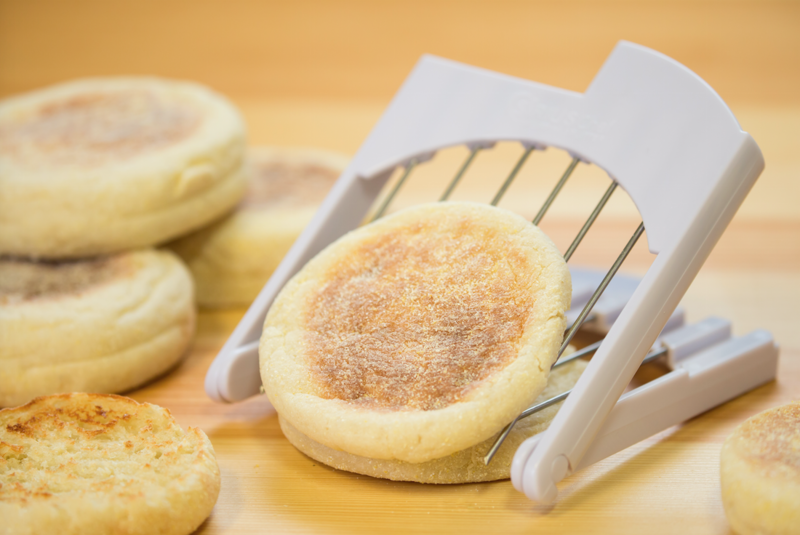 True aficionados know you never want to slice an English Muffin with a knife; doing so would ruin all those wonderful air pockets. Instead, you want to us an English Muffin Splitting Tool, which leaves two equal halves with perfectly preserved peaks and valleys. Thomas eventually opened a second bakery in a different New York neighborhood, and word spread fast. Fine hotels began serving it as a more elegant alternative to toast, and soon thereafter America in general embraced the English Muffin. It is now a mainstay of American breakfast cuisine. Restaurants, award winning chefs and fast food chains have incorporated English Muffins into their menus. Since those early days, the Thomas brand has been sold numerous times. In 1922, after the death of Samuel Bath Thomas, the family incorporated S.B. Thomas, Inc. In 1926, they registered the “Thomas” trademark. In 1970, the business was acquired by CPC, food conglomerate; in 1998 it was renamed Best Foods (known for its mayonnaise and other spreads). It was recently owned by George Weston Bakeries, an operating unit of George Weston Ltd., which sold it to the U.S. subsidiary of a Mexican baking company, Bimbo Bakeries USA, in early 2009. In addition to the Thomas' brand, Bimbo also owns other well-known brands such as Entenmann's, Ball Park, Oroweat, and Sara Lee. Is an English Crumpet the Same as an English Muffin?